We use Lithuanian Leathers round here. I have the Mondeo washed very 6 months there without fail. Much as I hate doing the job, I really don't trust a bunch of guys swilling gravel around their buckets with dishrags and waving a pressure washer lance within millimeters of my paintwork. It is at this point I feel I should fess up to the Mondeo being a lease car. 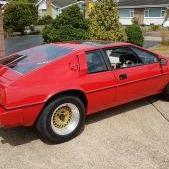 Car: 1981 Dry Sump Turbo Esprit. I have never ever used a car wash tunnel or someone other than myself to wash any of my cars or motorcycles etc. Pressure hosing or just hosing the car with Water is not an option in my humble mind. I would not even conceive those ideas in my mind. I have during the last more than 5 years of Esprit ownership only ever used soap Water (propper car mix) once. See pic. The only ever time it happened was the day I bought it after a 650 km return trip from Stockholm in Sweden, to Copenhagen in Denmark, to get the car ready for my ownership and wax layers. Every single time (at least once per week) I use a bit of window spray cleaner and a bunch of microfiber rags and microfiber towels. Does not scratch. And then propper wax. Once a month and also if I happen to meet a bit of rain on a drive, the underside of the Esprit, suspension, engine etc. is cleaned as well. No car or motorcycle is ever put into a garage wet or dirty. Leather is cleaned and treated once a month, Summer or Winter. After every drive car is cleaned if at all dirty, inside, out and underneath. Polishing the paint is always done by hand only. NEVER with a machine. and only happens very very rarely. Only once on my motorcycle, once on my Corrado and once on my Esprit. Smart looking washing women in bathing suits is best used as a poster on the wall of a teenage room. Once a year electrical contact cleaner is sprayed into all sockets and connectors. I use a Festool vacuum cleaner with HEPA filter inside on carpets, to minimize dust etc. Cars and motorcycles are never allowed to stay outside during night and generally when not being used. Stored in a okay'ish warm dry garage all year. It's simply a must. If someone parks a special car or motorcycle on the street here in my country, it's either being stolen or vandalised. Sorry, no fancy washing pics with lightly dressed women. Daily excercising program to keep fit to drive the Esprit and my Laverda is practised instead. 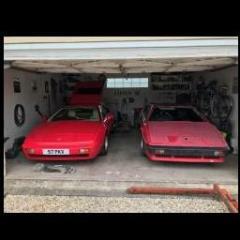 @Jacques is that a Corrado VR6 I see lurking in the background. I've had a couple, my sons are vw fanatics, but the Corrado is the only one I actually liked. Yep, but mine is a G60 and I've had it for over 7 years, and still makes 0,82 bar stock standard. New bearing and sealings at every 75.000 km. in the compressor is obligatory - then it lasts fine. No silly smaller gearing and chip to make the g-lader explode. You can differentiate between VR6 models and G60, 2,0 and 1,816v by looking at the bonnet. the middle section is higher on the VR6 cars for example. The Corrado is a partially handbuilt car made by Karmann in Osnabrück. 89.000 examples of which supossedly less than half is left today, usually because it's been vandalised by youngsters for a decade. For comparison the Porsche 911-996 first watercooled was made in 176.000 examples. The bodyshell is more than 60 percent stiffer than say the Golf 2 G60, which already had glued in window screens rather than held by rubber parts only. Last trip this year was today. Thank you Lotus for making such a supreme car to enjoy. My eldest still has one, Ive rebuilt a fes VR6 engines, they are awesome little lumps, simple compact and they sound lovely, camchain guide wear will cause camchain failiure around 130k if left, your son probably already knows but worth a mention. The old and the new - love this picture it shows just how dinky the S1 is! Jow big and clumsy the Evora liiks by comparison. And a lot less attractive desing. We put the remains of my first SE on display for the open day at Escape's Workshop. Probably the last picture, before it all goes in the skip (not the rim, I'll weigh that in). Actually quite amazing how well it has lasted, after the fire, being cut up to remove engine and chassis and spending 2 years outside. The beauty and ..... almost a SUV. 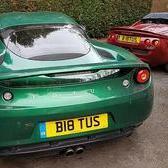 Sorry couldn't resist, I do like the Evora much better than 10 years ago. you may want to take a look at this interview, which happened before the original film was released.